The Salvation Army’s services of evangelism and social action began in East London, England in 1865 by Methodist Minister William Booth and his wife, Catherine. The Booths’ desire to share the gospel began amidst a city struggling with poverty and despair. In order to reach the people that needed the most help, William Booth took his ministry to the streets of London. His crusade was to win the lost multitudes of London to Christ. He went into the streets to preach the gospel of Jesus Christ to the poor, the homeless, the hungry and the destitute.Booth abandoned the conventional concept of a church and a pulpit and took his message to the people. His fervor led to disagreement with the leaders of the church in London. They preferred traditional measures. As a result, he withdrew from the church and traveled throughout England conducting evangelistic meetings. His wife, Catherine, was a major force in The Salvation Army movement. In 1865, William Booth was invited to hold a series of evangelistic meetings in the east end of London. He set up a tent in a Quaker graveyard and his services became an instant success. This proved to be the end of his wanderings as an independent traveling evangelist. His renown as a religious leader spread throughout London. His followers were a vigorous group dedicated to fight for the souls of men and women. Thieves, prostitutes, gamblers and drunkards were among Booth’s first converts to Christianity. His congregations were desperately poor. He preached hope and salvation. His aim was to lead them to Christ and to link them to a church for further spiritual guidance. Even though they were converted, churches did not accept Booth’s followers because of what they had been. Booth gave their lives direction in a spiritual manner and put them to work to save others who were like themselves. They too preached and sang in the streets as a living testimony to the power of God. In 1867, Booth had only 10 full-time workers. By 1874, the numbers had grown to 1,000 volunteers and 42 evangelists. They served under the name “The Christian Mission.” Booth assumed the title of a General Superintendent. His followers called him “General.” Known as the “Hallelujah Army,’” the converts spread out of the east end of London into neighboring areas and then to other cities. Booth was reading a printer’s proof of the 1878 Annual Report when the noticed the statement, ‘”The Christian Mission under the Superintendent of the Rev. 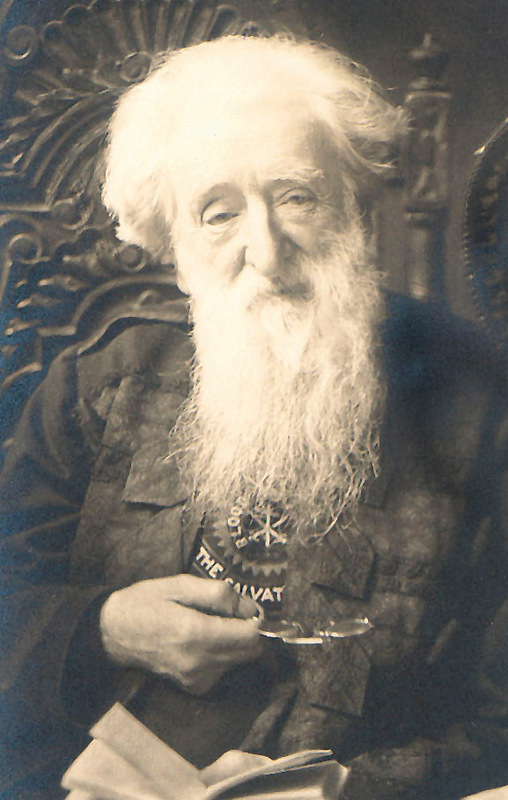 William Booth is a volunteer army. He crossed out the words “Volunteer Army’” and penned in “Salvation Army’” From those words came the basis of the foundation deed of The Salvation Army which was adopted in August of that same year. Converts became soldiers of Christ and are known as Salvationists. They launched an offensive throughout the British Isles. In some instances there were real battles as organized gangs mocked and attacked soldiers as they went about their work. In spite of the violence and persecution, some 250,000 persons were converted under the ministry of the Salvationists between 1881 and 1885. Meanwhile, the Army was gaining a foothold in the United States. Lieutenant Eliza Shirley had left England to join her parents who had migrated to America earlier in search of work. She held the first meeting of The Salvation Army in America in Philadelphia in 1879. The Salvationists were received enthusiastically. Shirley wrote to General Booth begging for reinforcements. None were available at first. Glowing reports of the work in Philadelphia convinced Booth to send an official group to pioneer the work in America in 1880. On March 10, 1880, Commissioner George Scott Railton and seven women officers knelt on the dockside at Battery Park in New York City to give thanks for their safe arrival. This was their first official street meeting held in the United States. These pioneers were met with similar unfriendly actions, as those in Great Britain. They were ridiculed, arrested and attacked. Several officers and soldiers even gave their lives. Three years later, Railton and the seven “Hallelujah Lassies”‘ had expanded their operation into California, Connecticut, Indiana, Kentucky, Maryland, Massachusetts, Michigan, Missouri, New Jersey, New York, Ohio and Pennsylvania. President Grover Cleveland received a delegation of Salvation Army officers in 1886 and gave the organization a warm personal endorsement. This was the first recognition from the White House that was to be followed by similar receptions from succeeding presidents of the United States. The Salvation Army movement expanded rapidly to Canada, Australia, France, Switzerland, India, South Africa, Iceland, and local neighborhood units. The Salvation Army is now active in virtually every corner of the world. General Booth’s death in 1912 was a great loss to The Salvation Army. However, he had laid a firm foundation’ even his death could not deter the ministry’s onward march. His eldest son, Bramwell Booth, succeeded him. Edward J. Higgins served as the first elected general, beginning in 1929. The first female general was Booth’s daughter, the dynamic Evangeline Booth, serving from 1934 to 1939. The Army’s fifth general was George Carpenter, succeeded in 1946 by Albert Orsborn. General Wilfred Kitching was elected in 1954, succeeded by Frederick Coutts in 1963. Erik Wickberg followed in 1969; Clarence Wiseman in 1974; Arnold Brown in 1977; Jarl Wahlstrom in 1981; and Eva Burrows, the second female general, in 1986. General Bramwell Tillsley was elected in 1993 and was succeeded by General Paul Rader in 1994, followed by General John Gowans in 1999, General John Larsson in 2002, General Shaw Clifton in 2006, General Linda Bond in 2011, and General André Cox in 2013.